A unique wealth strategy for a unique you. Make your portfolio work hard for you. You deserve a personalized portfolio that aims to maximize returns for your risk appetite. PhysicianWealth eliminates barriers like confusing fund choices, hidden information, and information overload to make 401k management accessible to all. When it comes to your 401k, one size does not fit all. Building wealth is a strategic choice. Saving for retirement wealth requires a long-term strategy, focus and a wingman. PhysicianWealth has designed Success Factors to help you build a wealth strategy and make every year count. The decisions you make about your 401k today have a huge impact on your future. Our methodology is rooted in rigorous academic research. Three silders to control your 401k. That's it. 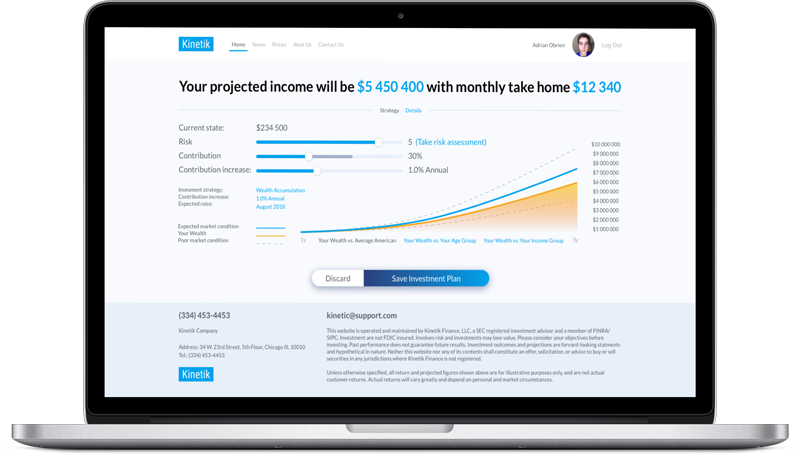 We have designed our app to simplify 401k management and take the guess work out of your wealth building decisions. Plus, PhysicianWealth connects with your 401k provider to execute your decisions and track your wealth growth. Investing in funds with low fees, diversifying your portfolio, and optimizing for risk are the first principles of investment. Seems simple enough. But when you factor in market changes, fluctuating fund performance, and over a dozen other variables, designing a portfolio quickly becomes complicated. PhysicianWealth's proprietary algorithm gives you the benefits of personalized financial advice without the sticker shock. Building wealth should be affordable. For $10 a month, we want you to be able to afford to invest in your future self without changing your lifestyle today. You can Netflix and retire. 49% of Americans are stuck in the same investments for years. Let us create a personalized portfolio for you.